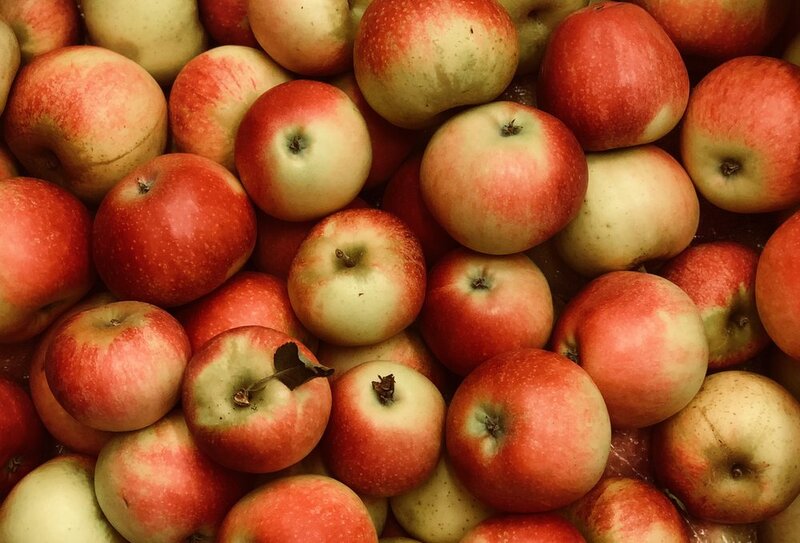 By mid-September the English Apple harvest is fully underway with ever more varieties joining the Discovery, which came to our shelves in mid-August. It’s now that the stone fruits of late summer, ending with dusky Damson plums, give way to northern hemisphere Apples and Pears. Apples grow well in a temperate climate and English apples are hard to beat. There are over 2,000 varieties – dessert, cooker and in-betweener. Sadly, only a tiny number of these are commercially grown. Flavours and textures vary greatly depending on the variety of apple. Deep red apples are beautiful to look at and tasty if eaten freshly picked, but it’s the green/brownish-skinned ‘Russet’ family and those streaked green/red that improve with keeping. Worcester Permain another early-mid season apple; can have a light strawberry flavour and is picked to the end of September. Early Windsor, a cross between a Cox and a Dr Oldenburg: similar to, and a little earlier than, the Cox’s Orange Pippin and should arrive up to mid-November. More apples will follow, including those Cooking Apples that need a little longer on the tree. For the kitchen, it’s hard to beat a Bramley for a classic apple pie or crumble but where less acidic, firm-fleshed apples are needed, reach for varieties like Laxton Fortune, Cox or Russet varieties or the later Braeburn. All have a good balance of sour and sweet. Good spices for apples are anise, cinnamon, nutmeg and vanilla. Clove too if used sparingly. A few apples added to a pan of roasting pork together with a few sage leaves is a wonderful thing. A simple apple puree cooked with dried fruits and cinnamon is a fixture in my kitchen during autumn and winter – so good with yogurt and a spoonful of honey. A whole baked Bramley, cored, stuffed with dried fruits and a little sugar, is the simplest of desserts. Just add cream. Everyone should have a good apple cake recipe. Replace some of the flour with ground hazelnuts and you won’t be disappointed. And then, of course, there’s Tarte Tatin! The English Apple harvest is now fully underway with ever more varieties joining the Discovery, which came to our shelves in mid-August. It’s now that the stone fruits of late summer, ending with dusky Damson plums, give way to northern hemisphere Apples and Pears.